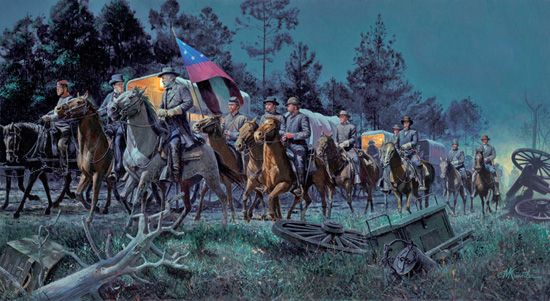 Mort Kunstler Hand Signed and Numbered Limited Edition:"Lee Takes Command "
About the Art: : They were words that changed the course of the war: "General Lee, I shall assign you to command of this army." They were spoken by Jefferson Davis, the president of the Confederate States of America, on an evening ride following the Battle of Seven Pines. A mighty Northern army commanded by General George B. McClellan had pressed Richmond's defenders back to the outskirts of the beleaguered Confederate capital. Then, at Seven Pines, the Confederate army commander, General Joseph E. Johnston, was seriously wounded. Who would now take command of the Southern forces defending Richmond? If the capital fell, the newborn Southern nation would surely collapse. Riding back toward Richmond through the darkness on Nine Mile Road, President Davis turned to his chief military advisor, 55 year-old General Robert E. Lee, and made him the army's commander. Although he had opposed secession, Lee was committed to defending his homeland from invasion, and he obediently accepted command. Within a month, he had driven McClellan's army from the field, and had reformed his command into what would become the heralded Army of Northern Virginia. By war's end, he had established a reputation of competence and character that was revered in the South and respected in the North - and had launched the legacy that would make Robert E. Lee the most admired military leader of the American Civil War. One of the decisive moments of the Civil War occurred in a single conversation between General Robert E. Lee and Confederate President Jefferson Davis. It was the moment that Davis asked Lee to take command of what would become the Army of Northern Virginia. From that moment onward, Robert E. Lee would display the greatness of leadership and character that made him America's most beloved general. Oddly, no major work of art has ever depicted this crucial moment in the War Between the States. I wanted to paint it for a long time. For ten years, I gathered research here and there, and thought about composition. Now it's a painting. To bring the viewer's attention to the two main figures and the key exchange between Davis and Lee, I used a number of design elements. A low eye level creates a triangular composition with Lee at the apex of the triangle. I also placed the flag at a point where it heightens that high point and adds color to the visual center of interest. By placing the lantern of the ambulance wagon directly behind Lee's head, the warm light contrasts with the cool moonlight, leading the viewer to look at Lee as the focus of the work. Members of Davis and Lee's staffs follow behind the two commanders. Dr. James I. Robertson, Jr., supplied me with details about the weather conditions on that last day of May 1862, which was very important. For instance, I did not depict any dust being kicked up by the horses because a heavy rain had recently fallen. I have spent a lot of time with horses, so I painted the tired mounts with their heads high in eager anticipation of getting back to their Richmond barn and feed. George Hicks, CEO of the National Civil War Museum in Harrisburg, Pa., graciously allowed his competent staff to provide research on Civil War ambulances. The museum collection includes a period ambulance in superb condition, which was very useful to study. This is the kind of scene I love to paint. It's filled with fascinating details, depicts the everyday objects of life during that time, and also preserves a pivotal moment in the history of the Civil War.